As a travel photographer, going through some of your old work is a bit painful at times. Like any trade, art, or skill, with photography, you’re always improving. It often means that looking back, well you find some gems some times, you also find images that you were once proud of and now think are rubbish. 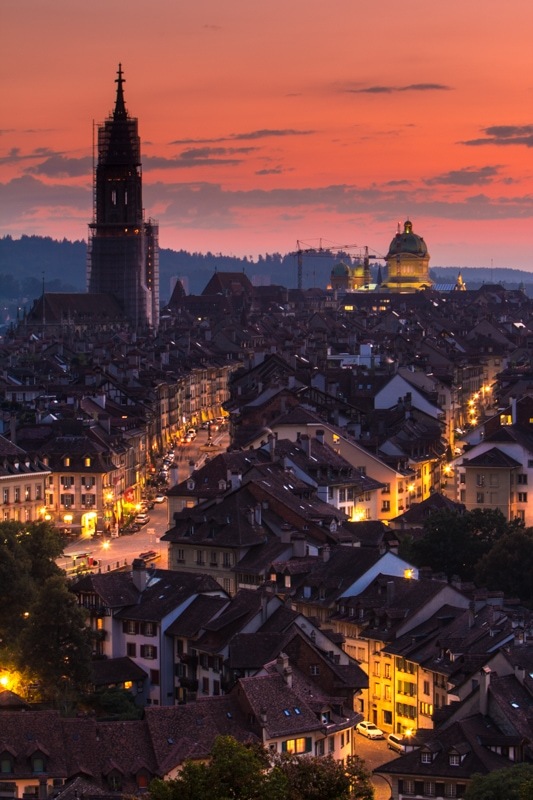 For me, my disappointments have long revolved around an evening shooting in Bern, Switzerland about 3 years ago. I really only had one day to shoot the city and, well, I feel like I wasted it getting stuck on one particular shot that was average at best. What made things worse, is that going through my images from that day there were so many other scenes that would have developed much better in the right light. 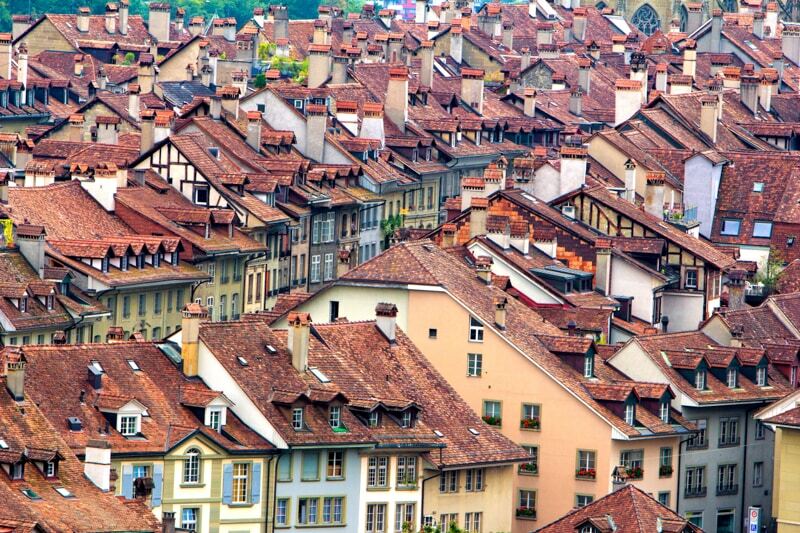 Thankfully, I had the chance to redeem myself in Bern thanks to a daytrip from here in Lucerne. This video is a “Getting the Shot” episode, the variety in which I take you from start to finish from developing an idea for a photo, to the scouting, to the actual shooting, and finally the editing process. 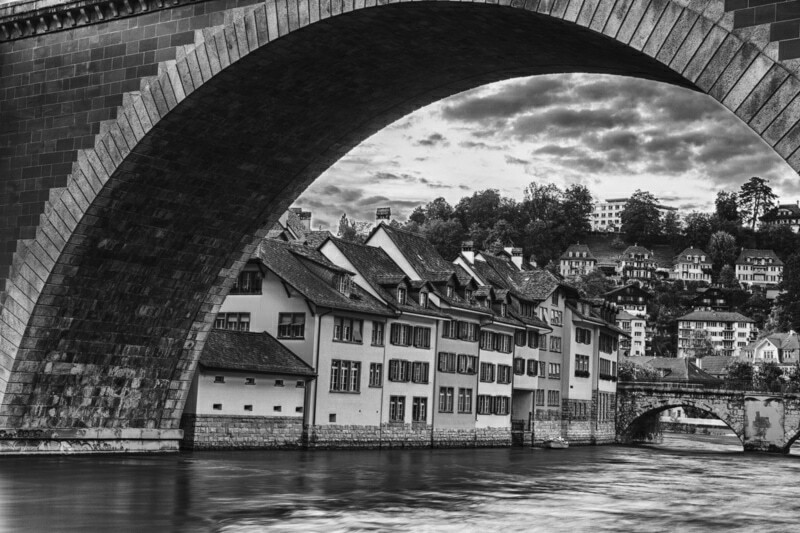 Check it out, and then below I have some information on travel photography in Bern, as well as the other images from the day. 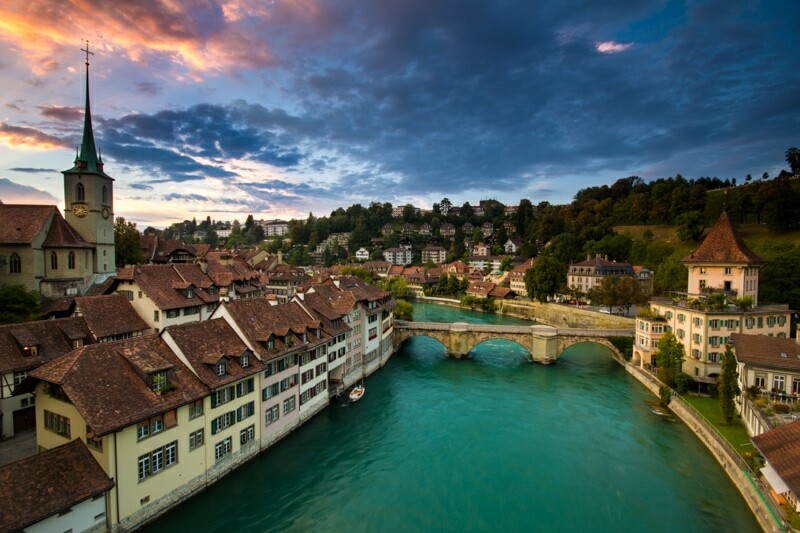 As the capital of Switzerland, Bern is easy to get to. All major trains lead to the city, so there’s no issue of getting here. 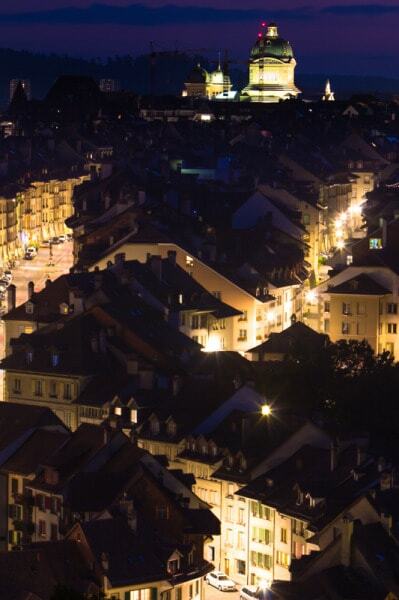 If you’re driving, you’ll want to get yourself as close to the old town as possible to park. We parked at the train station which ended up costing us 20 Swiss Francs. 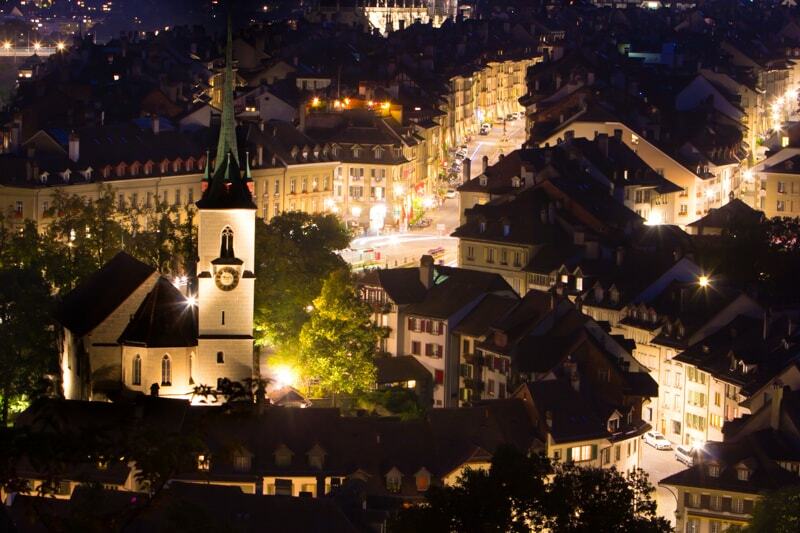 Even close to the old town, you can also park at the Casino parking which is slightly cheaper. For me, the best place in town to shoot is exactly where I went. I’m not sure there are actually that many different locations in the old town. 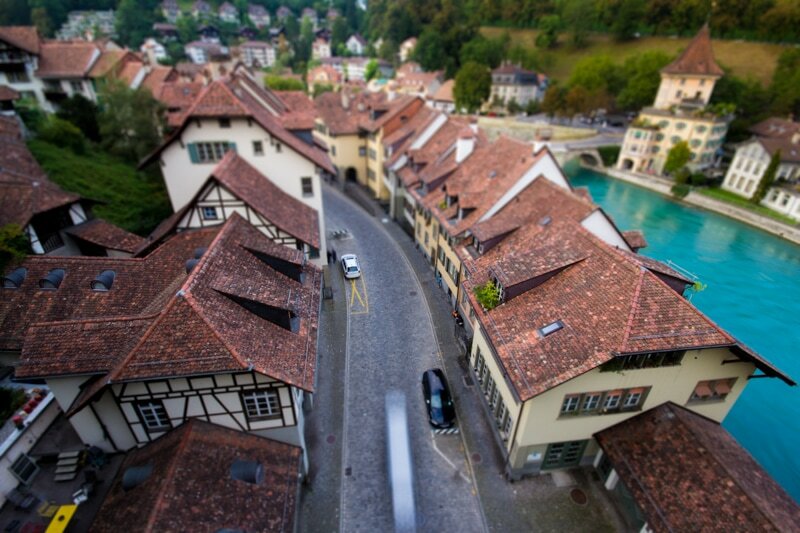 The best photos seemed to come from the edge of old town where the river bends around the city. It’s the most picturesque, in my opinion. Truth is, though, you could really walk anywhere along the riverfront and find worthy photos. In the map posted below you’ll see the 3 locations that I shot at sunset: on the bridge, under the bridge by the bears, and up on the hill looking down on the city. Other cool locations might be the parliament buildings and the cathedral. 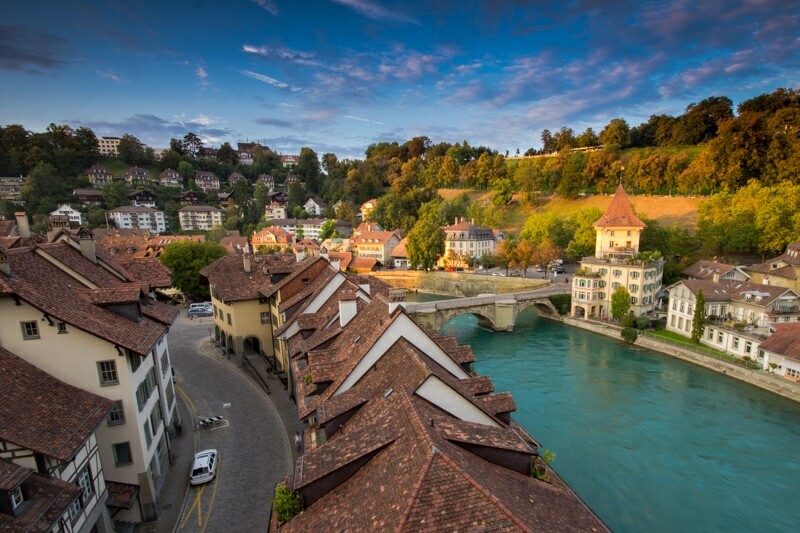 This trip through Bern I just came on a day trip. However, if you’re looking for a hostel in town, last time I was here I stayed at Berne Backpackers – Hotel Glocke, which was great. It is just a 3 minute walk from the bridge I shot at, and in the heart of old town. After the light went down, we raced up the hill to try to capture some cityscapes of Bern. We got some strange light, and probably would have been better off shooting this at sunrise rather than sunset, but it works. 70mm: f/7.1, 6 seconds, ISO100. The problem with the light was that they didn’t light up the cathedral and church until most of the good light was gone, so we got some harshly contrasted exposures like this one. 42mm: f/9, 15 seconds, ISO100. 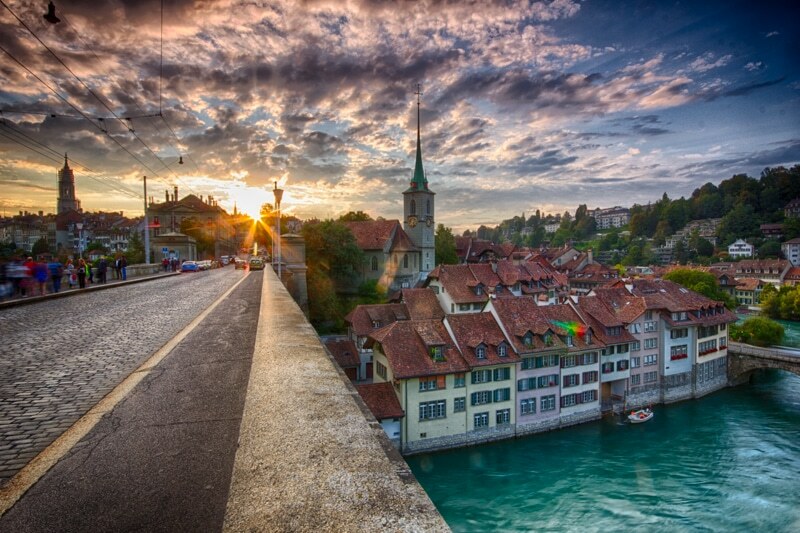 This was the last shot I took before calling it quits in Bern. Love the way it all kind of flows. 73mm: f/9, 30 seconds, ISO100. I’ve still got a photography app review for you in the next couple days. Then, I’m off to Iceland which I’m absolutely stoked for. I’m sure that I’ll have more than just a handful of videos from that trip. Stay tuned! Thanks Jim. And, yeah, I can not wait for Iceland. Really hope the weather is good to me! Wow! 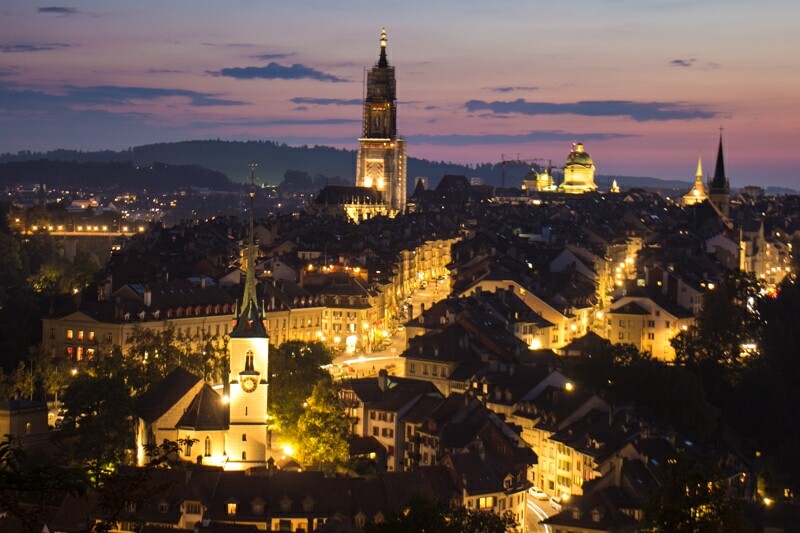 Thoroughly enjoyed your piece on Bern, Switzerland. What you can do with a camera is nothing short of amazing! Keep up the superb work! Thank you so much John, I really appreciate the comment! I love the journey through your shooting and editing, you have quite the developed eye. I struggle with night shots on my Canon EOS and need to learn more about the best settings. I agree with Jim above, nice “sunset shot of the bridge and the one over the river…”. Fantastic video, Brendan. Informative stuff and I love the pictures you ended up with! I simply love your “good light” photo! I wonder: how did you get the colours to be so vibrant? Is there any post-processing? If I take a picture like that in evening light, it’s usually much more grey… Maybe my 1100D isn’t sophisticated enough to make a picture like that? Thanks Maarten. Not the camera, actually. You could have shot this exact same shot with the same setup and editing process as I did. I got lucky with the light. It was an amazing sunset, so that helps. If you want the colours, you’ve got to shoot when the sky is colourful. I used a graduated ND filter as well which darkens the sky and lightens the foreground a bit and helps bring out those colours more. Then, it’s just a quick process in lightroom or photoshop. The 1100D is a small sensor, but that camera can capture this image just the same as mine did. Thanks for the tips! I need to experiment a bit more, but I’ll check your website for any other tips as much as I can… Loved your waterfall tutorial btw! The rooftop image gets the crown from me. It is bewitching. Wonder what am I still doing here, in this dank cubicle of mine? 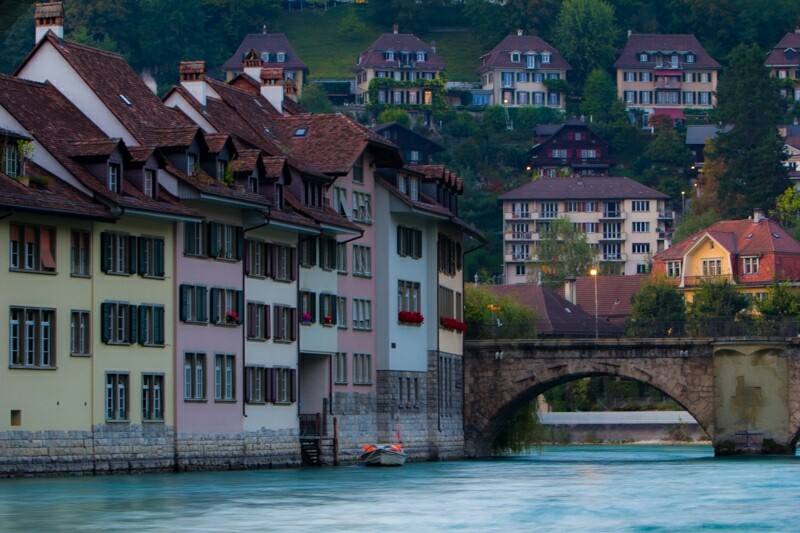 Great post and amazing photos which you captured.I really like this photos.Thanks for sharing your Switzerland Experience. Seriously nice photo. Proper uses of light, camera and your skill. Great Job.